If you are a frequent traveller, then you will be well aware of the fact that airlines are very strict on their rules and regulations regarding luggage. This can make packing for a trip an incredibly stressful experience. This is why it is so important that you consider your luggage options very carefully. By making sure that you have the right type of luggage, you will find preparing for your journeys far less stressful. Aside from sticking to the size limits, you also need to make sure that you have luggage that is easy for you to carry to and from the airport. Lightweight cabin luggage on wheels is often your best option. Of course, if you are going to be spending money on new luggage then you will want to make sure that you are making a wise purchase. This is why we have decided to test and review our top 3 carry-on luggage that is available right now. Please read on below for more information. Packing straps to allow you to reach maximum capacity. There could be more internal pockets. Having seen this particular cabin luggage on the market previously, we were very intrigued by the manufacturer’s claims that it is the lightest luggage in the world. After testing this carry-on luggage for ourselves, we have to say that it really does deliver. Made from durable rip stop fabric, the Cabin Max Stockholm feels incredibly durable. There is nothing cheap about the material at all. In terms of storage space, the Cabin Max Stockholm has plenty to offer, with two external pockets as well as one internal pocket and packing straps. We were actually really surprised by the amount that we were able to fit into our luggage, but given the 44L capacity we shouldn’t have been. The weight of this particular lightweight cabin luggage really does live up to the manufacturer’s claims. We found that even when we had packed it to full capacity, it was still very light in comparison to some of the others that we have tested. This combined with the telescopic handle and two wheels make using the luggage a very pleasant experience. The price for this particular luggage is actually quite affordable considering how high quality it is which is a nice added bonus. If lightweight luggage is what you are looking for then we strongly recommend the Cabin Max Stockholm. IATA approved luggage so it is suitable for all major airlines. Inline style wheels for smoother movement. The zips are a little on the flimsy side and may break under too much pressure. If keeping your cabin luggage lightweight is important to you then this is another very good option to consider. It is IATA approved, so it will be suitable for all major airlines. The first thing that we really liked about this particular cabin bag is the material that it is made out of. It is made from durable polyester which from our experience can feel a little cheap. However, we really didn’t find this to be the case with this one from INTravel. It feels like it has been really well designed and is tough enough to withstand regular travel. One of the things that really made this cabin bag stand out for us is the sheer amount of both internal and external pockets available. However, it is important that you don’t over pack because we felt that the zips feel a little on the flimsy side and would probably break under too much pressure. 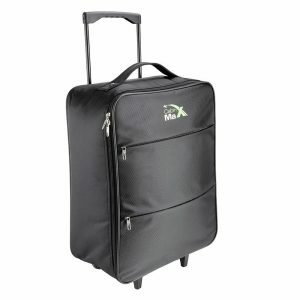 As well as a telescopic handle making movement in general much easier, this cabin bag has roller blade style wheels which make traveling at pace no trouble at all. If you want something that is cost effective with plenty of packing space, then this cabin bag should definitely be on your list to consider. Very affordable carry-on luggage option. Plenty of pockets to make use of. The material doesn’t feel very durable. Given that some people only require minimal luggage, we thought that we would test out one of the more compact cabin luggage options and decided to try out this one from More4bagz. Considering this is a fairly budget carry-on suitcase, we weren’t really expecting much from it but we were actually pleasantly surprised. One of the things that we were quite surprised about was the strength of the luggage in general. Whilst the polyester does feel a little on the flimsy side, the aluminium frame actually feels solid. This one also has multiple internal and external pockets so there is plenty of space for everything you need to pack in your hand luggage. 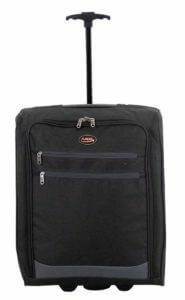 Much like the previous two on our list, this cabin luggage features a telescopic handle and the inline wheels which we saw on the previous product. What we really liked about this luggage is not only how lightweight it is, but also how compact it is. This made transporting it to and from our destination no trouble at all and the wheels turned incredibly smoothly. For a budget option this is a great choice. 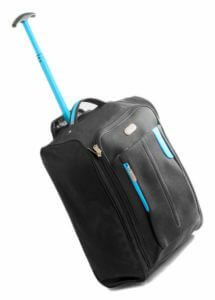 Hopefully now that you have read our verdicts you have a better idea of which type of hand luggage on wheels to go for to make your next journey even less stressful. The last thing that you want is to get held up at the airport so make sure your luggage doesn’t break any restrictions by buying a suitable carry-on case.